I completed Second Class requirement #6 on my hike this morning - identifying 10 kinds of wild animals. In just a couple miles, I saw a: chipmunk, grey squirrel, rabbit, red-wing blackbird, Canada goose, mallard duck, cardinal, baltimore oriole, goldfinch, and robin. There were many more birds and animals flying and scurrying about, but those are my 10. Actually, I complete that requirement nearly every time I walk around at this time of year. It's pretty easy to complete this nature requirement since the animals are out enjoying the warm spring weather. Finding animal evidence in the dead of winter can be much more challenging, at least here where it's all covered under feet of snow. What do you notice in the accompanying photo? The top half is a photo of a Canada goose on its nest I took while hiking this week. She knows I'm there and is trying to be invisible while keeping an eye on me. 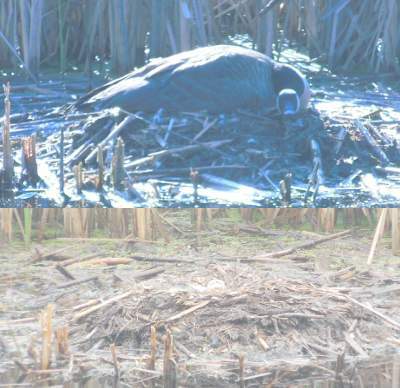 The bottom image is the same nest the next day. There are broken egg shells, but no birds. Canada geese leave the nest almost immediately after hatching so I expect the parents and goslings are out and about somewhere around here. When doing your animal identification, or any outdoors activities, remember to respect the wildlife you find. I took those pictures from the other side of a small pond, probably about 60 feet away. Give animals lots of room, take pictures from far away, and don't harass them at all. Especially this time of year, babies are abundant and some adult animals are very protective. For your own safety, as well as the animals', keep your eyes and ears open for signs of wildlife and don't invade their space. Respecting Wildlife is one of the seven principles of Leave No Trace which scouts should follow on all outings.